On Saturday, playing their 2013 season-opener at St. Paul Humboldt High School, St. Paul Pioneers players and fans anticipated a dominating game. It didn’t quite work out that way as St. Paul fell to a tough Fox Valley Force squad 21-12. The first play of the game, an interception by defensive back/kick returner Lionel Lamarre, gave no hint of what the end result would be. The Pioneers, uncharacteristically, would not score after Lamarre’s interception. In fact, the game remained scoreless until just before the end of the first quarter when Fox Valley would score on a touchdown pass to receiver Josh Kasuboski. Then, with two minutes to go before halftime, starting defensive end Garrett Johnson lay on the field before being helped up after injuring his knee. He would not return. The Force took advantage, scoring shortly after that on another pass from quarterback Dan Parker, this time to receiver Andy DeBruin. At halftime, the score was 14-0 Force. Pioneers fans weren’t worried, though. 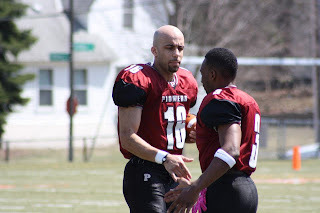 Just as at the start of the game, Lamarre gave the Pioneers a spark when he returned the second half opening kickoff to the Pioneer 45 yard line. However, the Pioneers offense, particularly the passing game, continued to struggle. 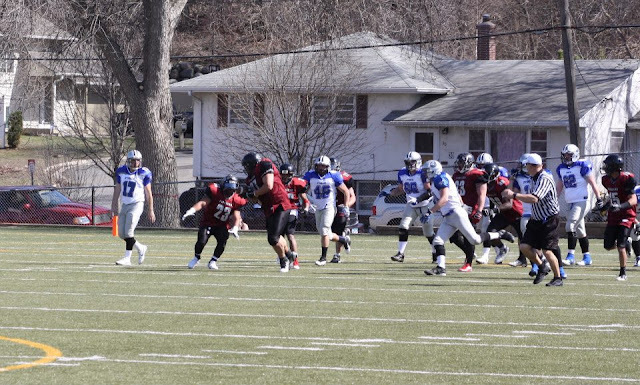 As a result, the team was unable to capitalize on the good field position or the fumble recovery by Mark Simmonds on the next Force possession. Then, with about five minutes left in the third quarter, the Force attempted a field goal after being denied the end zone by the stout Pioneers run defense. The Pioneers special teams unit had other ideas, though. Defensive lineman Edmond Smith, a new Pioneer from Augsburg College, got great penetration on the play and blocked the field goal. Tackle Jeff McGaster scooped up the loose ball and began rumbling towards the Fox Valley end zone. Just as he was about to be tackled, McGaster pitched the ball to linebacker John Robinson, who carried it the rest of the way for a Pioneers touchdown. The sideline and stands erupted in cheers. The Pioneers were finally on the board. The extra point was blocked, though, making the score 14-6 Force. After two Pioneers penalties, the Force were once again at the Pioneers 25 yard line. Nevertheless, they were still denied the end zone. The field goal they attempted went wide left.The score remained 14-6 until Pioneers linebacker Billy Quistorff recovered a fumble on a Fox Valley punt and returned it to the Force nine yard line. Then, Spriggs threw to running back Joe Sellwood in the right flat, who ran in for a touchdown. Spriggs’ pass on the Pioneers two point conversion attempt would fall incomplete. Still, the Pioneers trailed by just 2 points, 14-12, with about two and a half minutes to go. The Force derailed the Pioneers’ hopes of coming back on their next possession, scoring another touchdown on DeBruin’s second touchdown catch of the day. After running back Andy Folz returned the ensuing Force kickoff to the Force 45 yard line, a flicker of hope remained. A completion to Delane Woods was followed by three incomplete passes, however, and the Pioneers turned the ball over on downs. The Force would then run out the clock on the first Pioneers loss since 2011 – which also was at St. Paul Humboldt High School, against the Minnesota Dragons. Spriggs acknowledged lack of practice might have been a factor in the Pioneers struggles Saturday; however, he also said it should not have had the impact it did. McGaster echoed Spriggs’ statements, also saying there are no excuses and he’s confident the team will have it together next week. The Pioneers will face a tough Des Moines Blaze team, champions of the Midwest Football Alliance the past two years. Game time is 7p.m. at Sea Foam Stadium on the campus of Concordia University in St. Paul. Come join us for what is sure to be an exciting game! Tickets are $10. Children 12 and under are admitted free. NO PRACTICE TONIGHT! Thursday, April 18. We will be practicing at Jimmy Lee next Thursday, April 25, at 6 p.m.